Sitaram Jindal Scholarship 2019 : Sitaram Jindal Foundation has made the announcement of Sitaram Jindal Scholarship for the meritorious students of backward and schedule cast for pursuing higher studies. Through this scholarship student of Class X, XII Standard, UG, PG, ITI & Diploma Holders can get the opportunity to showcase their talent. Latest Update: Interested students for Sitaram Jindal Scholarship 2019 can download & submit the application form before the last date. Application Dates of SR Jindal Scholarship, eligibility etc will be available here for reference. Interested & eligible aspirants can download Sitaram Jindal Scholarship Application Form 2019 from the website. Therefore in regards to more details such as eligibility. rewards, SR Jindal Scholarship Scheme Last Date go through the article below. The Sitaram Jindal Foundation(SJF), formerly known as S.J. Jindal Trust, was established with a sole objective of serving the underprivileged and poor in various sections of society in different fields which include education, healthcare and rural development with discrimination on the basis of caste or creed. Every year it announces Sitaram Jindal Fellowship for the students of Class X to Class XII so that candidates can get the opportunity to show their talent in this highly competitive world. 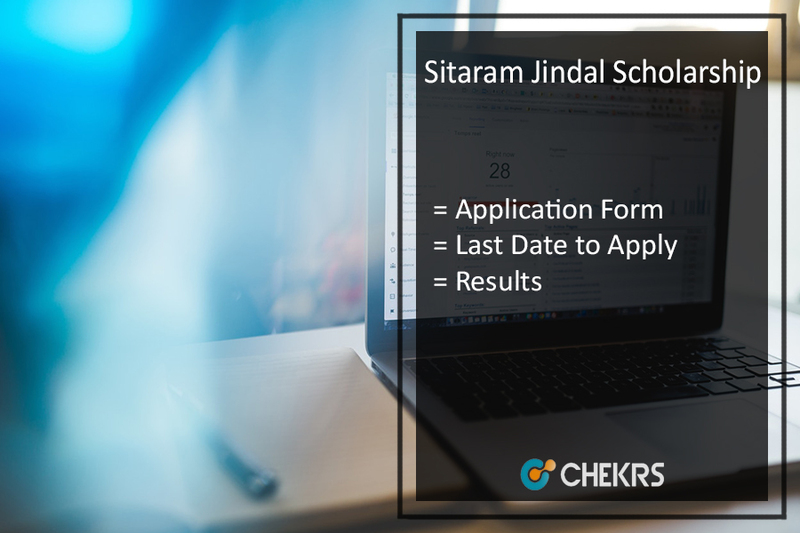 Recently it has announced the scheme of Sitaram Jindal Scholarship 2019 and therefore all the eligible candidates must apply for it before the last date. After submitting the application form the authority will release Sitaram Jindal Scholarship Selection List 2019 and declare the names of the candidates who are eligible for the scholarship program. All the interested and eligible aspirants must fill here the Sitaram Jindal Scholarship Form 2019 and accordingly apply for the fellowship program. Therefore applicants can go through below steps for the process of Sitaram Jindal Scholarship Application Form Download. Click “Scholarships” under the “What we do“ tab. Click on ‘Apply Online’. or Download Application & Annexures. Now If you don’t have an account on the website, Click on Sign Up Now. In the newly opened form Fill all the details and click on Submit Button. on the next page Fill all the personal details, then click Next, then follow the onscreen instruction to submit your Application. Click on Download Application & Annexures. Download & take a print out of it. Now send it to the address provided below. All the selected students whose name appears in the merit list are eligible for the scholarship offered the Sitaram Jindal Scholarship Amount as discussed below. Note: For post graduation courses candidates will get Rs. 200 p.m.
D Diploma Courses (Including Mech., Chemical, Environment, Nursing, Pharmacy & Physiotherapy) Girls Rs. 1000 p.m.
U.G. Course Boys Rs. 1300 p.m.
P.G. Course Boys Rs. 1800 p.m.
Sitaram Jindal Foundation has released the notification of Sitaram Jindal Foundation Scholarship 2019 for all the meritious students Class IX to Class XII to pursue higher education. Therefore interested students download Sitaram Jindal Foundation Scholarship Application Form and submit it before the last date. For more updates keep visiting our portal. In case of any query place your comments below. Sir / madam . When will be the selected list of jindal scholarship 2018 announced ? Sitaram Jindal Scholarship Selection List will be released soon. In which date I get scholarship… And what is the site for selection list? I have needed selection list of sitaram jindal foundation scholarship 2018.. This scholarship is for B.Ed students ?? Sitaram Jindal Scholarship 2018 is not for b.ed students. Hi Megha, There are no information about last date on Official Website and Notification, So exact last date is not available. Main thing is that Online Application filling option removed from the website, but offline is still available which indicates that may be only few days left. So Why waiting for last date details go with the Offline form and apply now. Thank you and Keep Visiting. when the selection list was released sir. Can I get my scholarship if I give my rural Bank saving account no. I e Langpi dehangi rural bank. Yes, You Can Apply for it. But before applying for it please verify Percentage and other details from the first table, and check Sitaram Jindal Scholarship Reward for Graduation students from the 2nd table. Good Luck. Thank you for connecting with us. Keep Visiting. I completed my degree 1St year sir. I secured 9.2 percent both in 2 sems. In university college for women’s HYD. Comment:is only UG students pursuing first year students apply for this scholarship? Aap apni scholarship ka status iss mail (scholarship.blr@sitaramjindalfoundation.org) par check kar skte ho and haan agar apko koi or dikkat aari ho to bhi aap inse sampark kar skte hai. List of selected students of sr jindal scheme when and in which of site uploaded???? The list of students will be uploaded on sitaramjindalfoundation.org/ which is the official website of the foundation. You just have to log in with your application number to know more about the status of your scholarship. When will be the selected list of Jindal scholarship 2017 announced ??? The list will be announced in the upcoming months..
when the list of selected students will announce.